A university investigative committee has concluded that Mason professor Edward Wegman is responsible for misconduct in a co-authored study published in Computational Statistics and Data Analysis. The committee’s findings were released Wednesday in a statement issued by Provost Peter Stearns to Mason faculty. “The relevant committee did find that plagiarism occurred in contextual sections of the [Computational Statistics] article as a result of poor judgment for which Professor Wegman, as team leader, must bear responsibility,” said Stearns in the statement. According to Stearns, the statement to faculty is one of three sanctions levied by the university in response to the findings—Wegman has also been asked to apologize to the journal and to retract the study. Additionally, “an official letter of reprimand” will be placed in Wegman’s file. 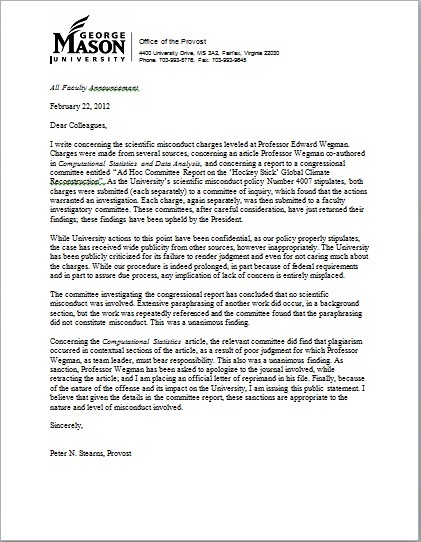 The “official letter of reprimand” is a document which outlines the results of the committee’s investigation and states Wegman’s responsibility for the misconduct, according to Stearns. Throughout the course of the investigation and now following committee’s findings, Wegman maintains his position with the university as a professor in both the Department of Statistics and the College of Science. Results of the investigation, noted in the statement, conclude that Wegman is responsible for misconduct in one of two separate reports called into question: a 2008 article appearing in Computational Statistics and Data Analysis and a 2006 congressional report critical of scientists’ reconstructions of past climate conditions. According to Stearns, the investigation involved four committees total. Both charges were first brought to separate committees for inquiry. Once the charges of both actions were deemed to warrant investigation, each charge was moved to two separate faculty investigative committees. The faculty committee responsible for investigating the 2006 congressional report unanimously concluded that no scientific misconduct occurred. The separate committee in charge of investigating the Computational Statistics and Data Analysis study found that misconduct did occur in “contextual elements” of that article. This was also a unanimous decision, according to Stearns. Plagiarism allegations surfaced in 2009 when retired computer scientist John Mashey published an analysis of Wegman’s reports on the Deep Climate website. Wegman responded to Mashey’s allegations in the fall of 2010, in an email to C2M. Wegman called the charges against him “unprecedented in my 42 years as an academic and scholar." The university began its investigation into plagiarism charges in 2010 following a complaint filed by University of Massachusetts professor Raymond Bradley. The complaint accused Wegman of plagiarizing one of Bradley’s textbooks and copying information from other sources, including Wikipedia. In the faculty statement, Stearns addressed criticism by some who believe the university failed to render judgment quickly and was disinterested in the charges. C2M has reached out to Wegman for comment. Correction: Tuesday, Feb. 28, 1:37 p.m. It was originally reported that Professor Wegman has maintained his position with the university as a professor in the Department of Statistics. Wegman holds a 30 percent appointment in the Department of Statistics, but his 70 percent, majority appointment is in the School of Physics, Astronomy, and Computational Science in the College of Science.